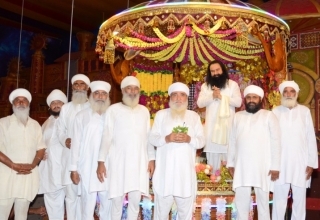 The Dera Sacha Sauda is well-known for its spirit of selfless service towards the world. With the inspiration and blessings of Saint Dr. Gurmeet Ram Rahim Singh Ji Insan, Dera volunteers work tirelessly to solve some of the most pressing problems facing our society today. Whats amazing is that their welfare activities aren’t just limited to human beings. In fact, the Dera Sacha Sauda routinely works on initiatives that seek to improve the environment and help out animals in need. For instance, earlier this week, volunteers of the Dera Sacha Sauda planted over 35 lakh trees at different places around the world in less than 24 hours. 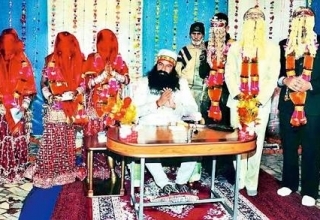 Today, yet another world record was created by the Dera Sacha Sauda ( DSS ) which already has several such achievements to its name. 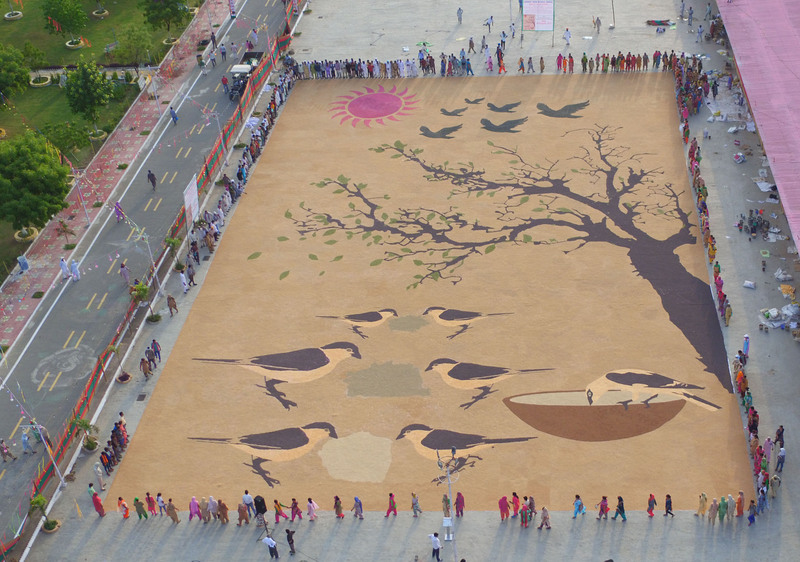 Volunteers of the Dera Sacha Sauda created the world’s largest mosaic using food grains for raising awareness about the welfare of birds. 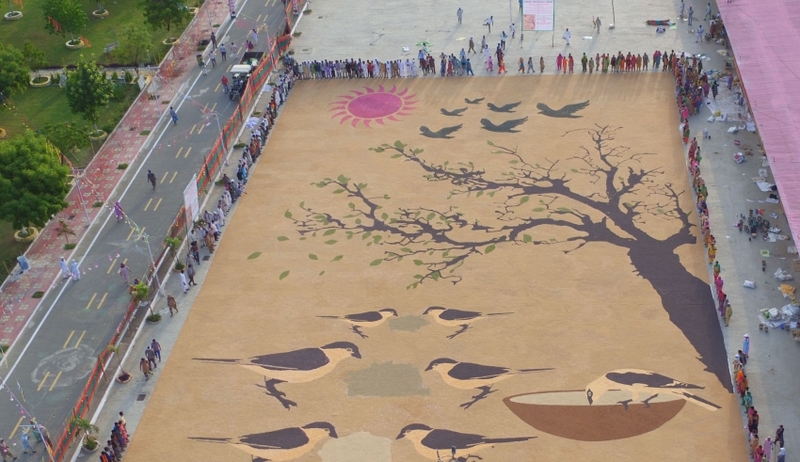 By creating the “World’s Largest Bird Nurturing” mosaic using a variety of grains, volunteers of the Dera Sacha Sauda seek to send a message to the world about the importance of protecting and conserving birds on our planet. The record was created at the Shah Satnam Ji Dham located in Sirsa, Haryana and this unique grain mosaic is spread across an area of a whopping 20,340 square feet. About 3737.48 kilograms of a variety of food grains were used in the creation of this mosaic. Creation of this world Record breaking food grain mosaic started on 10th August at 4:30 am and was completed by 6:30 pm ( 14 hours ). This mosaic shows the image of birds pecking on food grains and throngs of visitors have been flocking to catch a glimpse of this new world record that was set for a wonderful cause. The inspiration behind the World’s Largest Birds Nurturing mosaic lies in the teachings of Saint Dr. MSG. Saint Dr MSG has always stressed upon the importance of feeding birds and about fulfilling our responsibility towards the environment and animals. 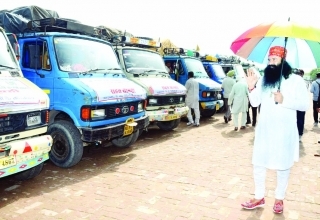 Indeed, “ensuring that birds always have access to food and water” is one of the 131 humanitarian initiatives that the Dera Sacha Sauda has been tirelessly and consistently working on. 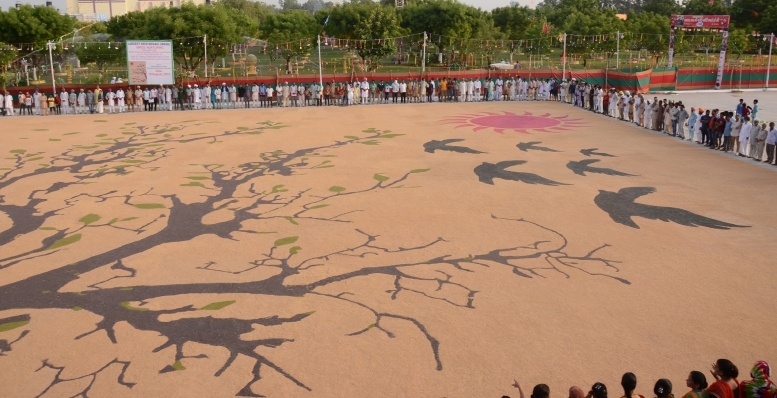 By creating the world’s largest mosaic, volunteers of the Dera Sacha Sauda wish to remind the entire world about Saint Dr MSG’s message and to ask humanity to take concrete steps towards feeding, protecting, and nurturing birds. Anyone living in an urban part of the world will have noticed how the chirping sounds of birds in the morning are slowly being replaced with traffic noises. 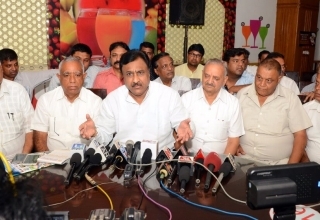 Indeed, birds like sparrows have rarely even seen in Indian cities anymore. Various species of birds are facing the threat of extinction around the world due to man’s greed for resources and our utter disregard for the environment. Birds help the environment by aiding the pollination of seeds which lead to more trees. Moreover, birds feed on bugs and pests which help in keeping the numbers of these insects in check. 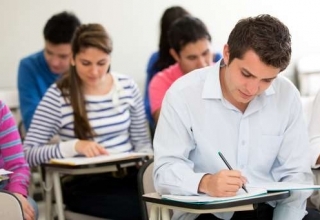 Studies have also shown that observing the movements of birds and listening to their chirping can help control the impact of disorders like depression and insomnia. It is a ray of hope then, to hear the teachings of Saint Dr. MSG who has always stressed upon the importance of birds in our environment and the need for us to protect and nurture them. In one of his sermons, Saint Dr MSG asked all followers to place a bird bath on their rooftops. In the months of summer, when water tends to be scarce, these baths provide birds with a ready source of drinking water and allow them to cool down in the scorching heat. This important message provided by Saint MSG inspired volunteers to create this record-breaking mosaic and to take this message to every corner of the world. Amazingly, the message of bird protection given by Saint MSG has also inspired several people in the past to create works of absolute wonder. Saint Dr MSG inspired volunteers: Take the example of Jeet Singh who works as a laborer in Himantpura. The message given by Saint moved and inspired Jeet Singh to go ahead and do something for the welfare of birds. After realizing that nests of birds are under threat, Jeet Singh started creating wooden shelters with his own hands and placed them at different locations such as near electricity poles and around trees. These handmade shelters provide a ready-made nest for birds and ensure their well-being. Moreover, Jeet Singh pays for the making of these shelters (which cost about Rs 90 each) from his own pocket. This is the amazing level of his commitment towards the cause of saving and protecting birds. The world record-breaking food grain mosaic too is a result of this inspiration and sends a wonderful message to all of the humanity. Indeed, if we all started putting in our share of contribution towards nurturing and taking care of birds, we will make a massively positive impact on our environment.